Former IDF general says ‘spontaneous rage’ riots are a message to Obama and Netanyahu, aiming at restarting Israel-PA talks. The “spontaneous” riots in Judea and Samaria in recent days are actually a message from the Palestinian Authority to Prime Minister Binyamin Netanyahu and United States President Barack Obama, IDF Major-General (ret.) Oren Shachor told Arutz Sheva. “There’s something organized here, maybe for Obama’s visit. They’re interested in a breakthrough, and they want a solution for the prisoners, too,” he said. Obama is planning to visit Israel in March. Top U.S. officials have said that Obama plans to listen to both Israeli and PA leaders, and then possibly to formulate a peace plan. 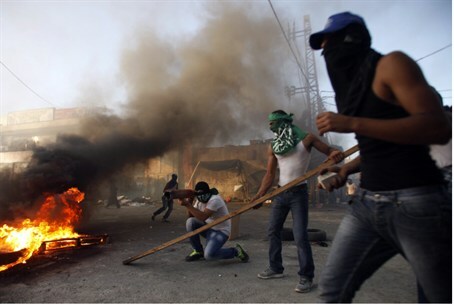 The latest PA riots were ostensibly sparked by the death of a terrorist prisoner in an Israeli jail. While Israeli sources say the man died of a heart attack for no clear reason, the PA insists that Israel tortured him to death. The PA has repeatedly demanded the release of all PA residents in Israeli jails as part of the peace process. “I get the impression that they [the PA] are behind this, and they are behind the desire to spur us on and start the diplomatic process,” Shachor said.